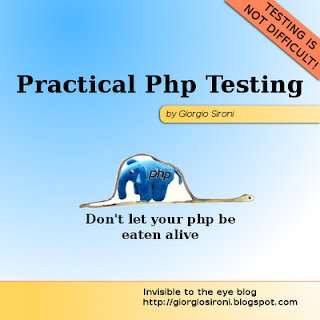 This is the ninth and last part of the php testing series. If you liked it, you should subscribe to the feed to check out similar articles in the future. Optimizing a test suite by adding test methods and test cases can be useful to improve the quality of your application code. Yet, every optimization starts with a profiling phase, that tells you where there is a need for test cases and where there is already a good coverage. Code coverage is defined as the ratio of lines of code exercised by the unit tests to the overall number of lines; the same ratio can be calculated using code blocks as the unit of measure. Phpunit provides code coverage reports generation via command line switches: one of them is --coverage-html $directory which places a human-readable html report in the $directory specified. There are other formats available, such as Xml, created for the purpose of interpreting a report with a third party application. 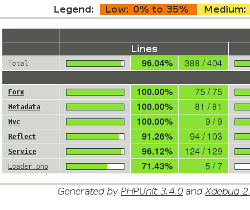 Please note that phpunit code coverage features require the xdebug extension to work. Another useful switch is the --configuration $file one. $file should be an xml configuration file that tells phpunit what files have to be considered as containing test cases. This is very handy to compose a suite and can substitute the famous and hard to mantain AllTests.php files. Running phpunit with this switch, instead of specifying a particular file, will force the runner to consider all php files which name ends in "Test.php" in the directories tests/ and application/modules/. While running a single test case gives as output a line of dots, running all these tests in sequence will result in multiple lines and in a list of all failed tests (although you can require the list of skipped and incomplete tests by using the --verbose switch) in the overall list generated according to the configuration. Along with the --configuration option, I strongly suggest to use the --bootstrap $phpScript directive. Your test cases probably need a global bootstrap phase for autoloading and setting up the include_path or other options. In some old versions of phpunit, you had to include a require_once() call at the start of each test script to make sure it was executed before the test. Now you can simply tell phpunit to run a file of your choice before starting with the test phase. Running an entire suite is a good practice to discover if your changes or refactorings have broken some functionalities. However, it's an overkill if you have to do it very often, like in a short feedback cycle for TDD: supposing you have more than one test case for your SUT, it can be useful to select all those tests and leaving out the rest of the suite. This is the case when the @group annotation is handy. You can mark with the @group $name annotation the docblock of test case classes, and also add multiple lines if you feel the contained tests can be useful in more than one scenario. Then the --group $group command line switch excludes test cases which do not belong to $group from being run. I hope these tips will be useful to you for utilizing phpunit at its best. It is a very well-crafted tool that you can take advantage of for TDD purposes, and also for functional and integration tests. Although the name suggests unit testing as a goal, you should certainly include in your test suite some functional tests, which exercise a feature provided of more than one object, and integration tests, which covers the wiring of your object and verify that your application works on an end-to-end basis. Bonus tip: using --no-globals-backup and --no-static-backup can speed up your tests execution by avoiding unuseful isolation of tests. If your application has no global state they will work correctly anyway. If you liked this testing series, you should subscribe to the feed to be informed of new articles on software development and php.